Ubax Menu Show your clients how fresh your dishes are with Ubax UpMenu restaurant menu theme. Increase the amount of food deliveries thanks to online sales. 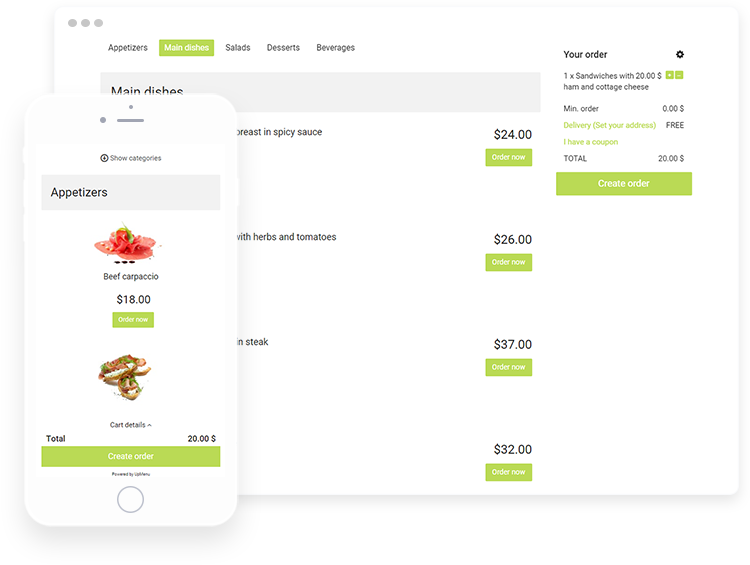 UpMenu templates Let your restaurant develop! Choose menu theme with a clever CMS support. Ubax Menu will help you accomplish success in no time. This theme is integrated with UpMenu system which makes it easy to manage. Fresh template Ubax Menu is a restaurant menu theme which looks very fresh and clear. White background and green elements create a pretty composition. You have the possibility to upload vivid photos of delicious meals. Ubax Menu brings more quality to your website. Is Ubax Menu for you? Do you wonder whether this menu theme is the best for your food place? We can help you decide. This template let you highlight an interesting menu which bases on classical or more sophisticated dishes. It looks bright so it should be chosen by a restaurant with positive vibes. Chance to grow New theme means more intrigued customers who may soon turn into loyal customers. This is great news. It means that simply purchasing a professional menu template may encourage your online guests to order more food from you than ever before!